Stitchin’ Sisters was originally started in 2001 by two friends, Rosemary Wissink and Cindy Mickelson, as an avenue to minister to women while using their combined creative talents. Needing graphic design work to help us learn the art of pattern development, we teamed with Cindy’s sister Lana to assist us. First we developed our purpose statement and then our identity with the common denominator of stitching sisters. In the beginning we did our own marketing, held quilt retreats, and vended at small shows. The pattern line grew and our lives changed with new demands and avenues. In 2002 Rosemary’s daughter Amy who was teaching school in Africa challenged her to take a step of faith and live out her purpose statement overseas! Now this was a big step for a small town girl. 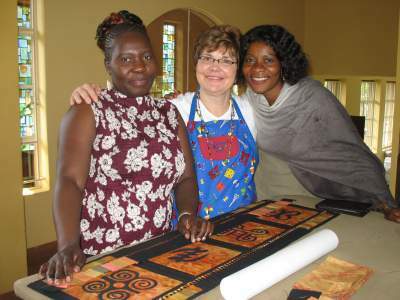 The challenge was to travel to Kenya and teach refugee women sewing and quilting at the Amani Ya Ju Center. This step and the ones that followed changed my life and the lives of others as both Cindy and I prepared and challenged other quilters to come along side us. The first Amani team, the “African Queens,” traveled to Nairobi, Kenya, toting several small sewing machines and sewing supplies in our suitcases to help and teach the refugee women who were from all areas of Africa. Working there brought new meaning to our purpose as we worked along side our African sisters. Their connections are what they have experienced in life: being marginalized, facing the burdens of ethnic cleansing, tribal wars, abuse, neglect, poverty, and often escaping for refuge while seeing their family members killed or separated. The Amani center helps them find a higher peace as they work together and share, overcoming cultural and ethnic barriers. The purpose is twofold, to give them sewing and marketing skills so they may be able to provide for themselves and their families. The second is to sow seeds of peace in the hearts of these women through Bible study, prayer and the connection of shared lives. All though we expected to find a lot of differences, what I found was how connected we are as people, women, mothers, sisters, friends, and wives. We all want the best for our families; we all need our friends, our families and our connections to each other. It was here I found the true purpose of the business to enhance the lives of others: to give back, to challenge oneself beyond what you feel you can do, and to let God work through your life. Stitchin’ Sisters eventually became a one woman show as life commitments changed for Cindy and Lana. As it changed, so did the opportunities to continue the connections with the Amani Center: traveling to Kenya and Rwanda in 2004 with my daughters and daughter-in-law to work with the women in the newly created sister center in Rwanda. Women helping women, what a perfect example of what I felt my business should be all about. Then came two more trips to Kenya with different teams of women that God challenged to come and minister, taking new sewing techniques, fabric dyeing, and even Paintstiks along with new pattern development. In 2007 the Stitchin’ Sis team was able to take them a mid-arm sewing machine and frame. Several African women were taught to machine quilt, increasing their production and product line. Although these are wonderful opportunities to help our sisters, it is not what draws me back or what binds me to these women’s lives. It is the sisterhood that connects and enriches my life with friendship, and the sharing of lives so different yet so much the same. It is being stripped of the materialistic view of life with all the abundance we have and knowing it is so worthless to our value. Although the philosophy of Stitchin’ Sisters has not changed, the ownership has. In late 2012, my dear friend, Cheryl Von Ruden, took over the business. Being amazing women and friends, I continue to mentor and design with Cheryl as she takes over the ropes! It is a great fit for us – we can design together each of us sharing our own unique passions and perspectives. Cheryl is developing a line of creative, fast and fun patterns for the modern quilter – look for the new ‘Little Sis patterns’. They are sure to be a hit! We hope to keep using our love of quilting and joy in helping others as we transition to the new opportunities in the ever changing quilt world. Please enjoy this exciting journey with us. Stitchin’ Sisters seeks to remain in business to help others use their gifts and talents, wherever they are. You may not be called or challenged to go to Africa, but you can always make a difference right where you are, touching others through sowing seeds of peace, encouragement, laughter, friendship and the joy of living for your God-given purpose, to serve him. I hope you will enjoy the patterns we have developed and they will connect you with others. I also hope you will visit the Amani web site, Amaniafrica.org, to see what my African sisters are up to and consider purchasing some of their fine products or supporting them by donation. Be creative, color outside the lines, give and receive, and find your purpose in serving others.